Goodness me. 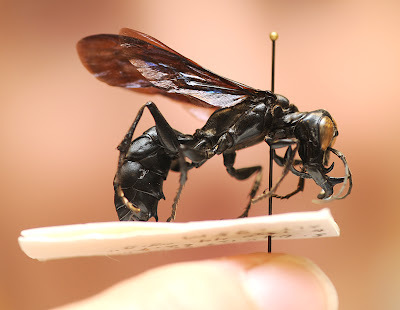 Meet what is currently being called the "Warrior Wasp". It's a newly discovered, gigantic wasp from Sulawesi in Indonesia. Despite being some 2 and a half inches long (7 cm or so) the male is not content with having proportionally large jaws. No, he demands inappropriately GIGANTIC jaws! It's difficult to argue with a wasp that big as it is. Now that he's got the manically massive mandibles he wanted we'll probably end up paying him a pension or sacrificing maidens or something. How big are his mandibles? Longer than his front legs. So long that when shut, they wrap around the sides of his face! It's not known what they're actually for, but it may well be about display or fights over females. Male lunacy usually is. Just like with the Dobsonfly, the female Warrior lacks the huge mouth-antlers. She's also smaller. Perhaps about the size of a really big wasp that you'd run away from. The male is more in "frozen in fear" territory. Being a sand wasp in the Crabronidae family, the Warrior Wasp is probably a predator. Hunting and slaughtering. Cutting and crushing. I wonder what they look like when they smile? laughing at the line 'male lunacy usually is.' HA! :) It's totally factual, too. It is our burden! Hahah! I wonder if you'd be rich, have enough for a beer or have no difference in your financial situation whatsoever.